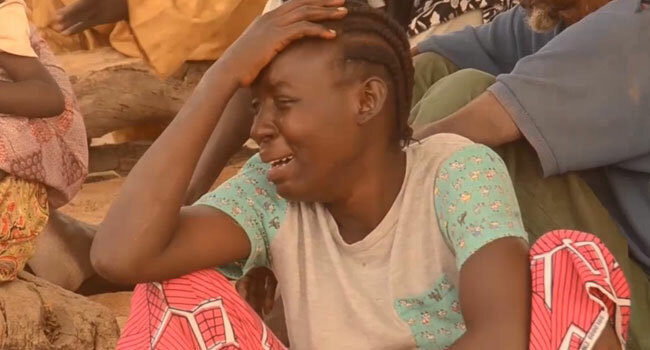 File photo of a woman crying after an attack on Adamawa community by gunmen. The social media on Friday went agog after gunmen attacked Birane village, Zurmi Local Government Area of Zamfara State killing 18 residents in the process. The gunmen suspected to be herdsmen attacked the village when hunters from Birani village intercepted and accosted a herder in the bush with some cattle and sheep suspected to have been stolen. The herdsmen later returned to the village killing 18 persons. The year 2018 began with reports of killings in various part of the country hitting the headlines. President Muhammadu Buhari in reaction to the New Year tragedy which occurred in Rivers, Ilorin, Benue and Kaduna State expressed shock and condoled with the victims. The year continued with increased attacks and death recorded in communities in Kaduna, Nasarawa, Adamawa, Benue, Ekiti, Oyo, Ogun among others. The bloodshed in Zamfara is yet another tragedy in a series.There is no enough tears to cry.Mourning is becoming part of our lives.Everyday is becoming a burial day.funeral is becoming a daily service.The most tragic of all tragedies is when tragedy is no more a headline. A massacre took place in Zamfara, everyone is relatively calm. We have been conquered. Our minds so messed up, our eyes seen so much blood that we don’t blink anymore. We can not continue like this. The recent Zamfara massacre goes on to prove that the Federal government and the citizens of Nigeria have a long way to go on the issue of security..
Buhari has to bring an end to this incessant blood shed! He’s got innocent blood on his hands! Okay, you are against state police. But how are we going to deal with a situation like Zamfara – where 41 people can be casually slaughtered like chickens with the present police arrangements? How do we deal with this intolerable state of affairs? I met some prominent people from Zamfara who briefed me on the killings two weeks ago. I volunteered to go and they laughed. They told me even they can no longer go home. It is that bad! My thoughts and prayers are with the bereaved families of those killed in Birani village in Zurmi Local Government Area, Zamfara. No place in Nigeria should be unsafe for our people to live in. May Almighty Allah comfort them. The #zamfaramassacre is unfortunate. This should bring to the fore that security of lives is our collective responsibility. Just like Benue, the minister of defense and the governor of Zamfara should be grounded till at killings are stopped.